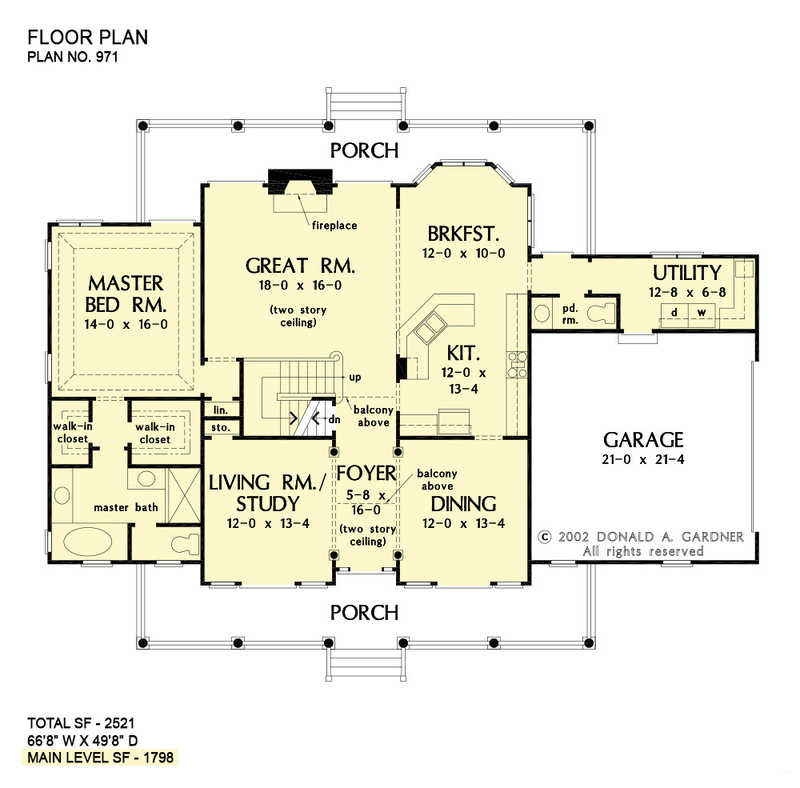 With spacious porches, twin gables, and an arched entrance, this house plan has overwhelming charm and curb appeal. Columns make a grand impression inside and out, and transoms above French doors brighten the floorplan. A tray ceiling tops the master bedroom, and the living room/study and bonus room are versatile in this house plan. 1st Floor: 1798 Sq. Ft.
2nd Floor: 723 Sq. Ft. 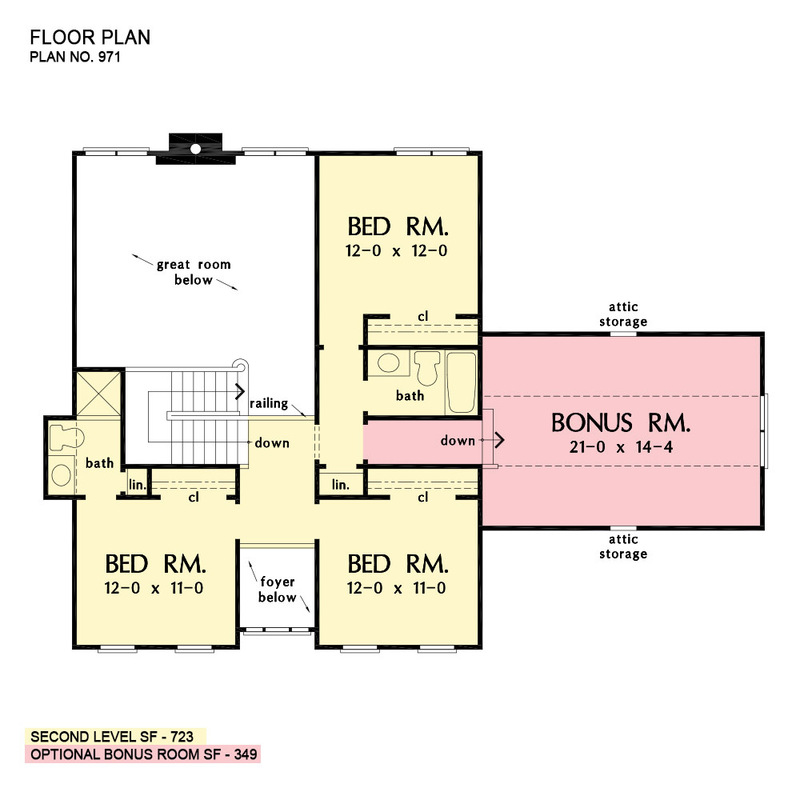 Bonus Room: 349 Sq. Ft.
House Dimensions: 66' 8" x 49' 8"
Great Room: 18' 0" x 16' 0"
Bedroom #2 : 12' 0" x 12' 0" x 8' 0"
Bedroom #3 : 12' 0" x 11' 0" x 8' 0"
Bedroom #4 : 12' 0" x 11' 0" x 8' 0"
Foyer (2 Story): 5' 8" x 16' 0" x 18' 1"
Dining Room : 12' 0" x 13' 4" x 9' 0"
Great Room (2 Story): 18' 0" x 16' 0" x 18' 1"
Kitchen : 12' 0" x 13' 4" x 9' 0"
Breakfast Room : 12' 0" x 10' 0" x 9' 0"
Utility Room : 12' 8" x 6' 8" x 9' 0"
Bonus Room : 21' 0" x 14' 4" x 9' 5"
Garage : 21' 0" x 21' 4" x 0' 0"
Porch - Rear : 43' 0" x 6' 0" x 9' 0"
Living Room : 12' 0" x 13' 4" x 9' 0"
Balcony : 5' 8" x 10' 0" x 8' 0"
Porch - Front : 43' 0" x 6' 0" x 9' 0"